Ocean King Fish Hunter Medal Game (6 players) is a fantastic new appealing 6-player video fish hunter game and mounted with latest ocean king software upgrade from fish hunter game machine, with new game play to fire for catch the fish, three types of unique gun weapons and 16 types of various fishes. Players can change their weapon strength from 1 to 3 level powers, with bigger fishing net by high level power and easier to shooting fish. 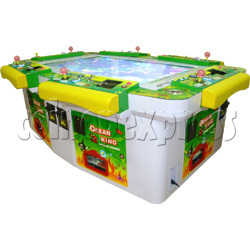 It features with attractive 3D cabinet graphics and a large high definition LCD screen, thrilling players from every corner. Ocean King fishing game comes with special features: bomb crab, chain thunder, twister, etc. Each feature has its powerful effect. Bomb Crab: while BOMB CRAB was captured by player, it will ignite explosion. And player can get extra points after explosion. Chain Thunder: there are 9 different symbols with Chain Thunder feature, including snapper, clown fish, butterfly fish, etc. while Chain Thunder was captured, player has chance to capture above 9 kinds of fishes appear on screen shot at the same time. Twister: each kind of Fish has Twister feature, while Twister symbol was captured by player, all fish appears on screen shot will be captured at the same time.